I am sitting here with the wind blowing and the sky overcast, feeling a little bit sad. My Boxer had been sick for two weeks and as I typed this, they did not know what was wrong with her. In July of 2002 I went to choose a puppy at the breeder’s house. They had originally lived kitty corner to us and this was their second litter – both times only 3 of the 4 pups had survived and out of the three, Maxine would not leave me alone. She sat on my lap and kissed and kissed me. In March 2004 she jumped at a glass window to ‘save’ me and she was the one who ended up being saved. She had cut her front paw badly, and her back paw severely and had we not been home, she would have bled out. Serendipity played a hand that day and the vet was still open. They saved her life and her limb and to this day I owe a lot of thanks to Bruce, Brenda and Megan. At the end of May she became ill and she was listless and not happy. We knew that soon, if they did not discover what was wrong with her we would have to put her to sleep. On the Sunday, after we had enjoyed this beautiful paella dish, she climbed onto my lap and slept like a puppy. Something she had not done since she was 10 weeks old! Maxine’s decline was blessedly quick. She had a heart tumour and the vets made sure we knew what was wrong with her before we put her down. 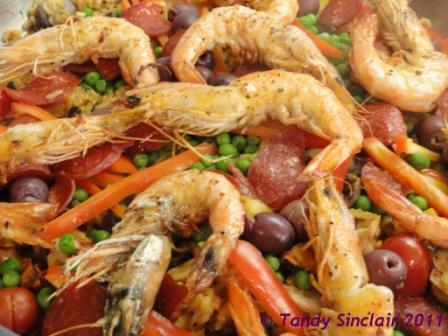 Paella was the dish I prepared for Eat For The Earth – something decadent that would encourage my guests to donate well – and well they did. Thank you Chantelle, Ewan and Taylor for your generosity and company. How sad, pets are so special and bring so much joy to our lives. Hope she is in doggy heaven 🙂 and eating all her favourite things. Poor Maxine, what a fine hound she was. for sure, good friends make all the difference in the world!